The first computer RPG to do more than simulate whacking orcs is free right now on Good Old Games. 1985 was a free-wheeling era. Marty McFly urged us all to go back in time, Reagan and Gorby were courting one another and Wall Street's excess was riding high. 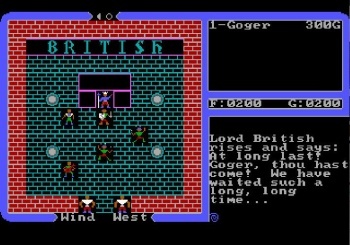 In contrast, the burgeoning videogame market was mostly comprised of platformers, shoot 'em ups and text adventures, so the industry was primed for Lord British, aka Richard Garriott, to bring the the world Ultima IV. Due to modern operating systems not being compatible with Apple II OS, we gamers haven't been able to enjoy the glory of Garriott's masterpiece, especially since any hacked versions on the web were brought down in March at the request of EA, who owns the IP. EA must have reached a deal because as of today, Ultima IV is available at Good Old Games. The best part? It's absolutely free. Now that is a virtue. The compelling RPG Ultima IV: Avatar blended text and graphics built around playing the most virtuous character possible to become the Avatar instead of just killing doodz. After all the bad guys were killed in the first three games, Lord British calls for an individual to master the eight virtues to live as an example to the people fo the newly formed nation of Brittania. Ultima IV cemented the reputation of the series and catapulted Garriott to the upper echelons of game design. Garriott was inducted into the Academy of Interactive Arts and Sciences' Hall of Fame in 2006. There's no word on whether Ultima IV will be free on GOG.com forever, so you might as well head over there and download it now. That is, if you have a spare 25 megabytes available on your hard drive.